Forest Live returns to Sherwood Forest this weekend for three nights of music headlined by Jake Bugg, Paul Heaton & Jacqui Abbott and Guy Garvey, plus support acts on each night. First up on Thursday, June 23 is Nottinghamshire’s Jake Bugg. Jake Bugg shot to fame in 2012 when his self-titled debut album entered the UK charts at number one, fired along by singles like Lightning Bolt, Taste It and Two Fingers. At 18, he was the youngest British male artist ever to achieve this feat. The album earned Jake Mercury Music Prize and Brit Award nominations. The follow-up, Shangri La, also made the top five and earned Jake another Brit nomination. His third album is expected to be released this year. Support on the night comes from new Irish band Walking On Cars, who are on stage at 7.45pm with Jake Bugg on stage at 9pm. The music continues on Friday, June 24 with Paul Heaton & Jacqui Abbott. Paul and Jacqui’s latest top 10 album, Wisdom, Laughter and Lines includes the singles I Don’t See Them and The Austerity of Love, which was a record of the week on BBC Radio 2. This follows their critically acclaimed, certified gold debut in 2014, What Have We Become, their first recording reunion since the multi-million selling days of The Beautiful South. Their Forest Live gig will see them play material from their new album and songs from The Beautiful South and the Housemartins. Support on the night will come from British indie-folk outfit Stornaway, who are on stage at 7.45pm with Paul and Jacqui on stage from 9pm. The Sherwood programme closes on Saturday, June 25 with a live set from Guy Garvey who best known for his 25 years, and counting, as frontman of influential rock band Elbow. 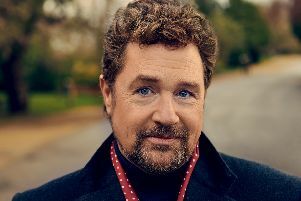 Guy is acclaimed as one of the UK’s most recognised and celebrated musicians and songwriters, which has made Elbow one of the most critically-acclaimed bands in the UK in the last 20 years, a feat underlined when they won the prestigious Mercury Music Prize in 2008 for their album, The Seldom Seen Kid. Support comes from Scottish newcomer C Duncan, himself a Mercury Prize nominee, who takes to the stage at 7.45pm, followed by Guy Garvey at 9pm. All three Sherwood gigs are at Sherwood Pine in Edwinstowe near Mansfield. For all three nights, the car park opens at 5pm with the arena open from 6pm.